Over the last few years the Holy Spirit has been speaking to me regularly about Italy. This has painted a rich picture of what He is planning to do. But it was only after I visited Milan this August that I have the full picture, and I understand what God is saying. It is my firm conviction that in the next few years God will begin to confound the negative expectations of both the world and many Christians, and begin a new move in Europe. And I believe that one of the major centres of this new move will be in the northern Italy. Prophets can speak to individuals, encouraging them, warning then and helping them to find direction from God. In this process, the prophets should never usurp the position of God—after all we all have only one Father and Master, and we all have been given the same Holy Spirit. If you want to learn more about this, please read my book Five Movements: Winning the Battle for Your Prophetic Gift. But here I am concerned of the function of prophets when it comes to the mission of the whole Church. Perhaps the clearest picture of what are the major functions of the prophets—and apostles—in the New Testament Church can be found in Paul’s Letter to the Ephesians. Most Christians in the Charismatic Church are familiar with the existence of the fivefold ministry, but we often miss the primary purpose of these ministries. According to Ephesians 4:11-16, the purpose of the fivefold ministry is to connect the body to the Head. And what is fascinating is that, according to the apostle Paul, this is mainly achieved by dealing with false doctrines! What Paul seems to say that is that it is easy to hear from God, once you remove the false doctrines and teachers that disconnect the body from the Head. So, the Church needs the prophets, together with the apostles, teachers, pastors and evangelists to deal with the false doctrines, and in their respective areas, help to connect the Church to Jesus. The fivefold ministry is like a surgeon that reconnects the body to the Head, and after the job is done they are redundant. They only have authority to align to the Head, not to themselves. But unfortunately, so many ministries today, seeking to profit from the body, attempt to connect the Church to themselves rather than to the Head! The end result is that the body will feed them and wither rather than the Head energising, growing and directing the body—this results in a partially paralysed zombie body! “For this reason I, Paul, the prisoner of Christ Jesus for you Gentiles—if indeed you have heard of the dispensation of the grace of God which was given to me for you, how that by revelation He made known to me the mystery (as I have briefly written already, by which, when you read, you may understand my knowledge in the mystery of Christ), which in other ages was not made known to the sons of men, as it has now been revealed by the Spirit to His holy apostles and prophets: that the Gentiles should be fellow heirs, of the same body, and partakers of His promise in Christ through the gospel, of which I became a minister according to the gift of the grace of God given to me by the effective working of His power. To me, who am less than the least of all the saints, this grace was given, that I should preach among the Gentiles the unsearchable riches of Christ, and to make all see what is the fellowship of the mystery, which from the beginning of the ages has been hidden in God who created all things through Jesus Christ; to the intent that now the manifold wisdom of God might be made known by the church to the principalities and powers in the heavenly places". According to Paul, the function of the apostles and prophets of his time was to make known the mystery of God that the Gentiles would also be coheirs of salvation. This function was primarily fulfilled by the apostles in the Early Church and by the prophets in the Old Testament and the Early Church. But there is another function linked to this function: make known the administration of this mystery of salvation. And this function continues today, as each generation needs to know how God’s grace to the Gentiles is administered in their generation. Unfortunately, the verse 9 is where NKJV fails us, as it speaks about “the fellowship of the mystery”, whereas most other translations use the words “administration” or “stewardship” of the mystery. The Greek word Paul is using is oikonomia, the economy of the mystery. But to use the word economy today would be misleading, as in Paul’s times it had a slightly different meaning than today, so that’s why the translators seem to avoid it. In Paul’s times the word economy referred primarily to the stewarding of the household finances, with household referring to the economic unit of family, servants and perhaps slaves—all the people depending on the finances of the household. So when in Ephesians 2:19 Paul writes, “Now, therefore, you are no longer strangers and foreigners, but fellow citizens with the saints and members of the household of God”, he refers to all the people who are part of the Church and part of God’s economy. It is great to know that we are part of God’s rather than the world’s economy! It is to the apostles and prophets that God will give the major revelation on how to administer this mystery in their generation, and perhaps in some future generations to come. Now, this doesn’t mean that God doesn’t give any strategies of mission to people who doesn’t call themselves apostles or prophets. Of course He does. But if God has given you great strategies in the area of mission that are being implemented by the Church and not just by yourself personally, there is a fair chance that you are ministering in a prophetic or apostolic anointing and calling without perhaps realising it. The function of the prophets is to reveal to the Church that this is how God will bring the Gentiles (and Israel) to Him in this generation. The door to the Kingdom is open, but like with Paul, sometimes God is redirecting our mission through prophecy, much as He redirected Paul to go to Macedonia through a prophetic dream. The apostles and prophets operate in the revelation of how God will administer His grace to the Jews and the Gentiles now and in near future. Unfortunately, many prophets and apostles have begun to build castles on the temporal sands of this world rather than on the eternal bedrock of the Church—Jesus. They will receive their reward in this time—money, power, fame—but they might be left empty-handed in the age to come. If you want to understand how this works, please read this post on the work we have been doing in the Middle East. Since then, this work has expanded to facilitate the discipleship of refugees who have converted from Islam in Europe and to helping many Arab churches and ministries in Europe. This is another work we couldn’t have foreseen, but which we had prepared for, faithfully, not fully understanding what we were preparing for. God is able to use anyone who is dumb but obedient! The dumb know they are dumb, so they don't even think that they can understand God's plan; they simply obey it. Whereas the intelligent often need to understand God's plan before they obey it. And because they will not be able to understand it without obedience, they will never step into it. The main currency of the household of God is obedience, not intelligence! So, what I am sharing now is in the context of the Holy Spirit revealing the administration and management of His salvation to the Gentiles: it is time to plant new churches and evangelise in the northern Italy. I had begun to pray for Italy specifically after I had visited Rome and my friend Claudio Ferro in April 2013. Claudio pastors a church in Rome and another one near Viterbo. As Claudio took us to the Papal Archbasilica of St. John Lateran, the official ecclesiastical seat of the Bishop of Rome, the Pope, the Holy Spirit gave me a clear prophecy for Italy. According to the prophecy, God would raise a new church in Italy that to the Italians wouldn’t look like a church at all, but more like “Starbucks and Gucci”, and that church would become very large in Italy. God would use the fact that the new church won't initially look like a church to most Italians to attract especially the youth. I only understood the meaning of this word better when I visited Milan in August 2017. It has been said that even the beggars in Milan wear Gucci! It is also a city of great creativity, fusing many things together in new ways. The new church would seem very contemporary, and it would be a mixture of Italian and foreign influences. This is not a mission that will be achieved by the Italians alone, but they will be teaming with other nations. In winter 2014, I saw a vision of Italy. It was a satellite map of Italy, and in the beginning, the whole map was completely dark. But then, the northern part of Italy lit up, and this light spread rapidly from the northern border down to the area of Florence. Then the spreading of light stopped for a while, until it began to spread slowly toward Rome. At the time, it was clear to me that a wave of revival would begin to spread from the northern Italy. I have visited the northern Italy regularly over the last few years. And I must say that the spiritual atmosphere there is very open. I end up talking about God without even trying to talk about Him. It seems that the northern Italians are very open to contemporary expressions of Christianity, although many of them steer away from Catholicism. Also, when my friend Claudio launched a new church near Viterbo, it has been growing much faster than the one in Rome, with new converts joining the church. Unfortunately, He never gave me any clear explanation at the time, although, somehow, I sensed that this word had something to do with Italy. There aren’t many things as frustrating as the Holy Spirit speaking to you clearly about something and then refusing to clarify the issue. But I guess waiting for a thousand years might be even more frustrating! Again, it was after I visited Milan in August 2017 that the Holy Sprit gave me final clarity on this. On the plane to Milan, I felt that the Holy Spirit was saying that Milan was important and that He would show me why it is important. The first reason why Milan is important is that it seems that Milan was the birthplace of the first wave of reformation in the early 11th century—nearly 1,000 years ago. The Patarine movement was the first reform movement in Italy and probably in Europe. They were a medieval group of lay craftsmen, tradesmen, and peasants who organised in Milan about 1058 to oppose clerical concubinage and marriage; the group later widened its attack to oppose generally the papacy’s moral corruption and temporal powers. The Patarine movement was so called because, under the leadership of Arialdus (Arialdo), a deacon of Milan, its members used to assemble in the Pataria, or ragmen’s quarter of the city (pates being a dialectal word for “rag”). Viewed by the church as heretical, the Patarines, though short-lived in terms of organised activities, became an impetus for a large number of religious-reform movements that arose during the decline of the feudal system and the beginnings of the aspirations to power of the peasant and middle classes. As far as I know, this was the first significant reform movement in the Church. In many ways, it was only a partial reformation and also at least partially misguided, but so was the Reformation of Luther and Calvin also only a partial reformation. In fact, every reforming movement up to this point has been only partial. The Patarine movement was followed by reformers such as St Francis of Assisi. But why would God look into the past when He is speaking about the future? The answer is simple. Christ is the tree and we are the branches. When a branch has been growing in the wrong direction for a while, it is sometimes necessary to go to the beginning of that growth to understand what happened, and if possible, to straighten the branches. That is why the prophets often speak about the reformation of the past, and renewal, at the same breath than talking about the future mission of the Church. Another word that the Holy Spirit has been speaking to me about Italy is that the blood of the martyrs has already been shed. Milan plays a significant part when it comes to the blood of the martyrs in Europe. The Edict of Milan is a proclamation that permanently established religious toleration for Christianity within the Roman Empire. It was the outcome of a political agreement concluded in Milan between the Roman emperors Constantine I and Licinius in February 313. The proclamation, made for the East by Licinius in June 313, granted all persons freedom to worship whatever deity they pleased, assured Christians of legal rights (including the right to organise churches), and directed the prompt return to Christians of confiscated property. Previous edicts of toleration had been as short-lived as the regimes that sanctioned them, but this time the edict effectively established religious toleration. This was the first time when the persecution of Christians had been permanently illegalised, and it was the establishment of any religious freedom that we have had in Europe for the last 1,700 years. I believe God remembers that and will revisit Milan for this reason alone. Unfortunately, the persecuted soon became persecutors, and it was Como and the area of Milan, being near the borderline of Switzerland and Italy, that fought against the Reformation especially hard. If you read the history files, you find out that the Reformation in fact spread to all parts of Italy, including Rome and cities and places in the south such as Naples and Sicily, but it was crushed ruthlessly with crucifixions, killings and burnings of thousands of reformers. The inquisitor of Como, a town by the Lake Como near Milan, was rewarded for his ruthless work for crushing the Reformation in Italy by giving him the position of the Pope! So, Milan is the place where our relative Christian freedom was gained for the first time. Milan is also the place where the first steps of reformation were taken, inspiring other reform movements. It is also the place where the spread of the Reformation into Italy was stopped. I believe that God will once more visit Milan and bring what He started a thousand years ago to fulfilment. In 1996 I saw a vision whilst in London. It began with a map of Britain, and a bright fire burning inside M25 that circles London. Out of that fire flew sparks that travelled to three areas in Finland—to Helsinki, the capital, to Tampere where I studied, and third to my hometown Pori. The spark travelled between these three locations, and suddenly, the whole nation burst in fire. Then, the spark headed to Africa. Then I saw a man, in the beginning of a long road. There was a beautiful rose by the roadside. He picked it, glanced at it, and tossed it away. The rose died instantly. I understood it was poisonous. It was a bright day and you could see to the end of the road where there stood a huge black figure that resembled the evil Darth Vader from Star Wars films. It released a swarm of demonic bats against the traveller who looked like Luke Skywalker. He pulled his sword out and tried to fight against the bats. The bats completely clouded his vision. The traveller could never defeat the bats with his sword. He should focus on progressing along the road instead. After all, the bats couldn’t hurt him, no matter how ugly and nasty they looked, but they could obstruct his vision. “The beautiful rose is the sin of spiritual pride,” the Holy Spirit said. “You will pick it up but see that it is worthless. The devil will release a fierce demonic attack against you. The only way you will be able to see will be by listening to My voice.” The vision troubled me. There were elements that seemed clear from the outset. It seemed clear that the fire referred to a coming revival in London, Finland and perhaps elsewhere. In Star Wars, Luke Skywalker has to stop trusting in his natural sight. The Jedi Master Yoda teaches him to fight blindfolded, so that he would learn to rely on the Force rather than his sight. It seemed to me that God was telling me that, likewise, I would not win my future battles if I relied on my natural eyes. So, since 1996 I have been expecting a move of God that will somehow touch London and Finland, and also make some sort of impact in Africa. And I have expected that this move will be greatly opposed by Satan even before its birth. In 2009, I saw another vision that I know now is linked to Italy. I was in prayer on Sunday night in September 2009 when the Holy Spirit spoke to me. “I’ll show you the throne room and you will see why we’ll win the war. There are certain rules. What matters is who wins.” I was eager to see the throne room of the Lord. “Please Lord, show me the throne room!” I said. Then I fell asleep. When I woke up, I saw a vision but not about the heavenly throne room I had expected. “This is a mountaintop vision so that you will be able to see what will happen,” the Lord said. I saw an arena for gladiators. There were no fighters alive. The arena had a circular form and no exit or escape routes. It was surrounded by stalls. I stood in the arena, the blood-soaked sand touching my feet. At the centre of the arena there was a large floating sword created from indestructible material. It was the heaviest of all swords but also the lightest. I understood that anyone wielding that sword would be able to crush any resistance, and that nothing could withstand its power. Hundreds of lightnings struck all around the arena through the performance at the Verona Arena. I looked around. All around the arena, there were little thrones with all kinds of disgusting figures seated on them. These were the demons and principalities responsible for attacking people with sins such as pedophilia, adultery and sins of the deepest darkness. Some weeks later I was taken back to the arena in another vision. Two massive angels, around fifteen metres tall, entered the arena and began wielding their mighty swords. The heavy enemy thrones were crushed as if they were made of paper. No one had taken the indestructible sword. The angels’ swords were smaller and less shiny than the indestructible sword. “Who will take that sword?” I asked. “I’m the Warrior King. I’ll take this sword,” He said. “I’ll fight this war. When I fight a war, I never lose.” Then the Lord, the Warrior King, picked the sword. I realised that the sword had been there for centuries, waiting for Him. The sizes of angels, demons and Jesus in the vision aren’t realistic but illustrate their power in relation to each other. The angels that went to war were larger than the demonic principalities but Jesus was a lot bigger than anyone else. No one could stand against him. The vision relates to the spiritual shift that has begun to take place in the Middle East. Jesus has gone to war and He will bring millions of Muslims to Him. When I saw this vision it was clear to me that it primarily concerned the Middle East, but not exclusively. Since then we have seen the rise and the imminent fall of the Islamic State, more terrorism in Europe and the huge influx of Arab refugees in Europe. And in many ways the spiritual destinies of Europe and the Middle East have become mixed. 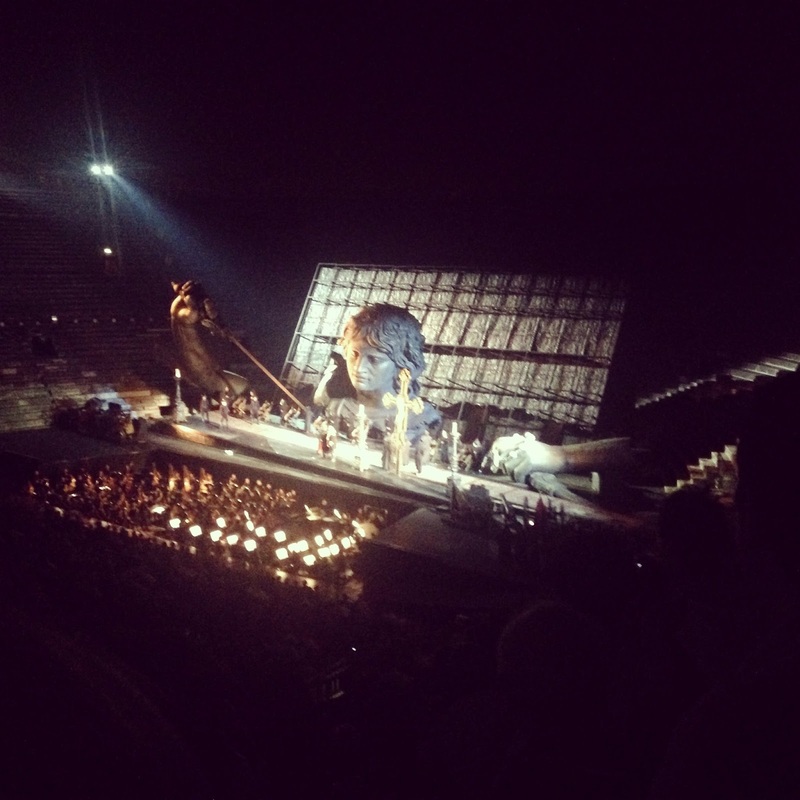 In August 2015, we were at the Verona Arena in Italy to watch Tosca, an open-air opera. The Verona Arena is the most preserved Roman arena in Italy, and it would have been a place where many Christians were martyred. A year earlier we had been in Genoa, and we had seen a poster of the Arena on the hotel wall. On the poster, the arena looked exactly like the arena I had seen in the vision years earlier. The floor of the arena was also covered with red carpet, which resembled the blood-stained sand I had seen in the vision. The large prop representing Napoleon, which I saw over 20 years ago in a vision. Since visiting Genoa, my wife had been dreaming about being there for a long time, and we had finally made it to Verona, but unfortunately, we had booked our non-refundable tickets for an evening when it started to rain in the beginning of the opera. As it is an outdoor arena and the instruments the orchestra uses are invaluable, the show can get cancelled even if it rains a few drops. The first part stopped and restarted a few times, as it began to rain heavily, and the orchestra kept on leaving and returning with their instruments when the rain started and stopped. We began to pray, as they were considering cancelling the show altogether. But then the rain stopped altogether. The second and third part played uninterrupted. 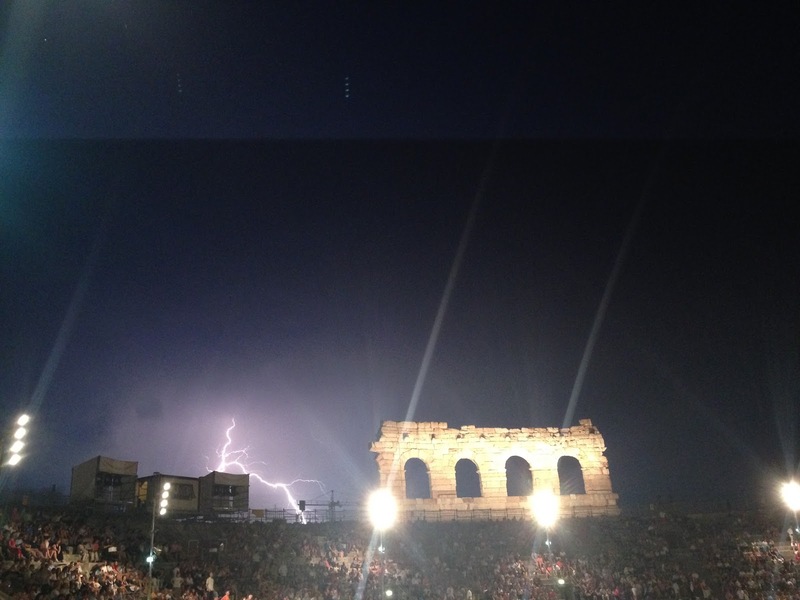 But all around the arena, there were hundreds of lightning strikes, as the thunderstorm ravaged the surrounding area, but stayed away from directly above the arena. It was a bit like what we saw in Trafalgar Square but late at night, with the storm avoiding the arena. But the nearest lighting strikes kept on hitting the ground less than a mile away. When the main set was revealed it shocked me. It was a huge portrait of Napoleon who had conquered most of Italy. The prop had the exact face of the man I had seen in the vision in 1997, holding the sword, like Napoleon was holding the sword, and walking down the path. When I had seen the vision in 1997, I had understood then that God was using Star Wars as an allegory, but the man’s face wasn’t Luke Skywalker’s face. But when I had walked in, I had seen the pharaohs I had seen on the arena in the other vision, but now outside, as they were props from another set. It was as if the pharaohs representing principalities had been pushed out from the arena by the huge figure holding the sword. That night, the Holy Spirit brought together elements from two major visions I had seen. And they were illustrated by the arena which I had seen in a vision and by props I had seen in a vision—in different times in my life. I had a clear sense that God was calling me to pay very close attention to what was taking place. The interpretation of this is now clear to me. God would raise a Church that would have the spiritual authority to dominate the arena of Europe. The pharaohs had been displaced and they were now outside the arena. They were no more dominating Europe. Through the prayers of the saints, the destructive forces of thunder would now be kept outside the arena for a season. The expensive instruments of revival would now be played in Europe like never before. There is another aspect to this stream which concerns the influx of the Arabs and other refugees to Europe from the Middle East: the spiritual destinies of Europe and the Middle East are now merged. 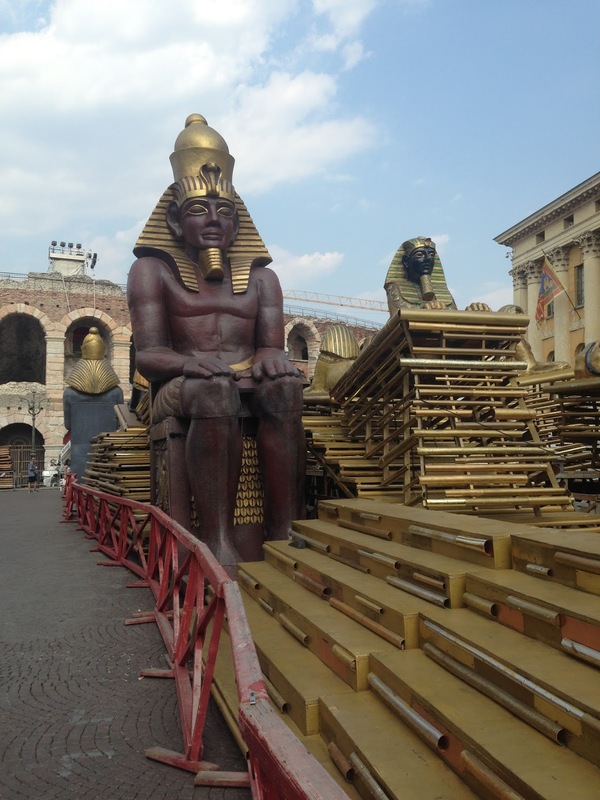 Pharaohs from 'Aida', another opera playing at the Verona Arena, pushed aside outside the arena. It is now when I understand that there was a message through the intervals as well. The first wave of the reformation which was triggered in the 11th century Italy never really took off properly. There were starts and stops, and what was achieved before the Protestant Reformation was rather piecemeal. In one sense, the reformation was nearly cancelled. The second stage of the reforming of the Church in Europe advanced uninterrupted. But there is a third stage of the reformation that is yet to come, and it concerns Italy and other “unreformed’ European nations. There will be a short season when God’s glory and salvation power will be fully displayed in Europe. And like Napoleon at the gates of Rome, this move of God is at the gates of Europe right now. I have really tried to figure out what God would show me many visions over the years and then bring it together on a stage of an opera. Why would He do that? Well, He just did, "to the intent that now the manifold wisdom of God might be made known by the church to the principalities and powers in the heavenly places". In many ways, this arena and bringing together of all these elements visualises how through the Church God will make known His manifold wisdom to the principalities and powers. It is my firm belief that God will now finish the job that was started nearly one thousand years ago in Milan and bring the fullness of the reformation to Italy. This won’t probably mean that the Catholic Church would be reformed. But it will mean that there will be a significant presence of new reformed churches in Italy. Part of this reformation will be the return of spiritual gifts to the body of Christ in Europe, but the new context will be love rather than the stage performance based ministry model that dominates our understanding of the gifts today. I have written about this reformation of our understanding in my book Supernatural Love: Releasing the Compassion of Jesus Through the Gifts of the Spirit. Now comes a serious warning to us: what has always troubled me about the vision linked to London is that I could only see a fire in London, and not in the rest of Britain. This seemed to imply that we are not talking about a national revival in Britain but about something more limited. I have come to the conclusion that perhaps it is not a revival as such at all, but preconditions for one. As I was writing this, the Holy Spirit reminded me that He has in fact, fulfilled the first part of the prophecy, namely that there would be a fire inside the M25. Quietly, almost invisibly, London has become the most religious city in the UK when it comes to sheer number of believers, and also, when it comes to the percentage of believers in the population. But this religion, including Christianity has mostly been imported. Regardless of denomination, from the Catholics to the Anglicans, the Methodists and the Pentecostals, the church growth that is taking place in London is sustained almost exclusively by immigration. If you go to a Catholic church, it might be Asian, to Hillsong, white, to a black church, African, but it is the immigration flows that are keeping the church of London alive. For example, between 2005 and 2012, church attendance in London grew from 620,000 to 720,000. The number of churches grew at roughly the same rate. So, a great reversal has taken place. White England, Scotland and Wales have largely turned away from God, whereas a zealous fire for Jesus within the M25 is kept burning by a steady flow of immigrants. Like in my vision, the fire is contained, as it is kept alive artificially by adding more and more immigrants into the mix. But neither did I see Italy in the original vision, so I don’t think that it is an all-encompassing vision. In fact, I don’t even think that there will be a major revival in London at all preceding it. But this is a European revival and to some extent, the ability of Britain to be part of this revival will be dependent on their relationship with the rest of Europe. Now, Brexit doesn’t mean that Britain won’t be part of Europe, but I have seen many attitudes in the Charismatic Church harden when it comes to Europe. I have heard many demonise Europe in Britain, at a time when we are losing our nation. According to a recent survey, 53% of Britons have no religion at all. I have made my views on the EU and its institutions clear in this post that deals with the teaching that seeks to demonise the EU. But to those who consider the EU to be an anti-Christian organisation, please remember that the Early Church grew and prospered under the Roman Empire, which was definitely a lot more ungodly empire than any of the post-Roman European empires—perhaps apart from the slave-trading nations of Europe, which include the British Empire. And before we are ready to condemn the Germans, we must remember that Britain was also guilty of starving tens of millions of Indians to death. The truth is that nearly every European nation, including Britain and Finland, have at least in one part of their history done terrible things. Much has been made of the non-religious nature of the EU institutions in Britain. But in fact, like with the USA, this has all to do with the separation of state and Church. And in fact, it is the EU and its push for religious freedom that has enabled Charismatic churches to grow in Eastern Europe. If you don’t believe me, just compare the situation in Eastern Europe between the nations that are part of the EU and those who are not. In those countries that are not part of the EU, the persecution of Protestant Christians is still rife, whereas in the Eastern European countries that are part of the EU, the Protestant churches, by and large, have the freedom to grow and prosper. And it is this same EU and its demand for equality that is enabling the Protestant churches to penetrate the Catholic heartlands without fear of persecution. The last time a wave of reformation tried to push its way to Italy many Protestants were crucified by the Inquisition. This time, it will be different! It will be the EU that will protect the new wave of reformation. It might protect many other things as well, but it will also protect the reformation against any state churches. It might not be the primary purpose of the EU by its designers, but that is the way God is using it. Things might look different from the British Isles, where it has been centuries since dissidents have been persecuted. But it is only slightly more than 25 years from the end of persecution of Protestant Christians in parts of Eastern Europe. My mother used to smuggle Bibles to Russia, so I am all too aware of this. So, it is my conviction that although the EU is far from a the perfect institution it could be in the ideal world, God has instituted it in Europe for a season to further religious freedom and enable the coming reformation. My advice to the British Church—no matter what you believe about Brexit—is to stay open to the move of God in Europe. You might not accept the European institutions—but the Church and the expansion of the Church have always been universal by nature. So, whatever your political views, don't let them skew your sight when it comes to what God is and will be doing in Italy. Why does it sometimes take so much time to receive and understand prophecy? I have really struggled with that. Why has God used so many channels and ways to put together one clear message? Why hasn't He just given it to me in one download? Prophets have to learn to wait for extensive periods. Usually, by the time the prophetic word comes true, it has been forgotten by everyone else. Daniel must have been studying the writings of the prophets for years, seemingly in vain. But then one day Daniel grasped it and then he started praying in line with the prophecy. So, Daniel finally understood Jeremiah’s prophecy, but he didn’t understand his own prophecy! And even when the events prophesied would eventually happen, only the wise would understand. The same thing happened with the disciples. John writes in John 20:9, “For as yet they did not know the Scripture, that He must rise again from the dead.” So John believed that Jesus had risen, not because he understood the Scripture, but because Jesus had risen! Often, we begin to fully understand prophecy when its fulfilment is already starting, as the fulfilment begins to explain the prophecy. It was only after the resurrection of Jesus that the disciples began to see that there are multiple prophecies in the Old Testament foretelling the death of Jesus and His resurrection. They had heard Jesus foretell His own death and resurrection, but nothing like that had ever happened. Yes, Jesus had raised Lazarus, but now Jesus Himself was dead. This is something that we don’t fully understand about revelation—receiving and understanding it takes the strengthening of the inner man through the Holy Spirit—in other words, spiritual authority. Through all this God demonstrates that He is in charge. He is fully in charge of the revelation He gives to us, and without His Spirit we remain unable to understand even the prophecies we have spoken out ourselves! But also, as He is in control of the revelation and its explanation, we have the confidence to share His word, as we know that there is no way we would have even subconsciously manoeuvred our life in such a way that we could have reached the desired end result. In fact, most of the time, we don’t even know what the intended end result is! But today, I am expectant. I believe that in the next few years we will be finally stepping into something the Holy Spirit also revealed to me in 2009: a season of around 30 years when a wave of reformation and salvation will sweep over Europe.